Egypt and South Korea are making plans to celebrate the 22nd anniversary of the establishment of diplomatic relations between Egypt and South Korea on May 13 April, with a range of cultural and artistic events in the offing. 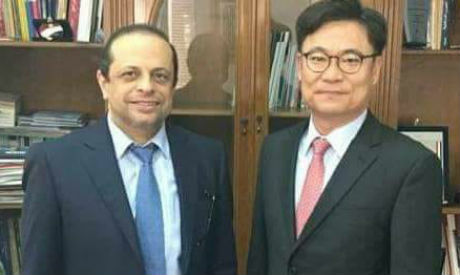 The foreign-relations sector at the Egyptian Ministry of Culture is working with the Egyptian Embassy in Seoul to prepare a range of events to take place in Seoul. These include folk arts, musical performances, and a series of lectures and cultural seminars on Egypt. There are also plans for visual arts exhibitions that reflect the development in modern Egyptian art. Last week, Hisham Mourad, head of the Foreign Cultural Relations Sector at the Ministry of Culture, met with Yang Sang Keun, director of the Korean Cultural Centre, for discussions on the programme of events. Mourad said the initiative reflects the eagerness of Ines Abdel-Dayem, Egypt's minister of culture, to boost Egypt's presence in most of the artistic and cultural forums around the world. The South Korean authorities have invited Egypt to participate in various cultural festivals, tourist and promotional events in 2018.